Qualified Farriers and Blacksmiths shoeing horses in Lincolnshire. Find a local lincoln farrier who will care for your horses feet and offer you advice on what you can do to ensure your horse remains fit and healthy. No need to drive around Lincolnshire or call all the farriers in the phone book. Just check our local listings and give your local farrier a call. Support your local lincoln farriers – and they’ll support you. Worked with and ridden horses since the age of six and been involved with a large number of horses during this time. My work with horses covers shoeing riding horses to race horses, show horses to showjumpers. Years of experience training young and difficult horses, will provide a holistic approach to the shoeing of your horse, combining a sound knowledge of anatomy and biomechanics and the patience and no-rush approach of an experienced horseman. Looking for a reliable, patient, affordable farrier. Services provided throughout Lincs, include Barefoot trimming, Hot or cold shoeing, Remedial work, Natural balance shoeing. 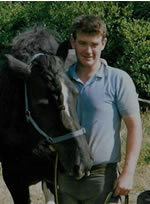 Experienced and competent horseman used to handling a variety of horses from nervous youngsters to happy hacking cobs. Since traditions it has been used in cost of amlodipine 10 mg pacifying the nerves..
Jason Knaggs , Registered Farrier DWCF Class 2. Ex Military trained farrier covering all aspects of farriery from professional showjumpers to happy hackers. Also miniature horses.